Home » Benjamin » extinct. » Tasmanian » Tiger » 'Benjamin', the last known surviving Tasmanian Tiger. When he died in 1936, the species became extinct. 'Benjamin', the last known surviving Tasmanian Tiger. When he died in 1936, the species became extinct. 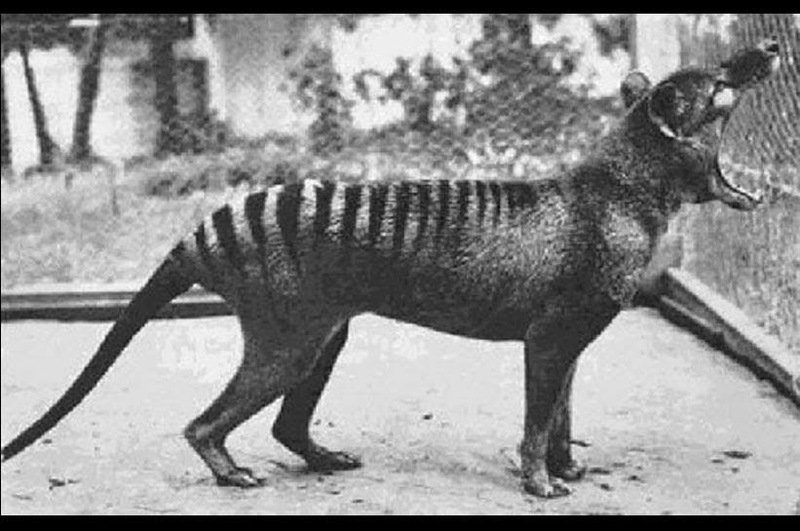 The Tasmanian Aboriginals called the Tasmanian Tiger coorinna, loarinna, laoonana, or lagunta. These native names did not achieve any popular usage and disappeared with the extinction of the Tasmanian Aborigines. The Tasmanian tiger or Thylacine was by far the largest carnivorous marsupial of recent times. Its overall appearance is very canid-like. Total body length is around 1 meter. The tail length is around 50-65 cm. The tail itself is very thick close to the body and quickly tapers to a point. It is around 60 cm in height at the shoulder. The upper body is brownish/grey with a pale underside. There are 13-19 black vertical stripes that run from the mid-back to the base of the tail. The face is grey with white markings around the eyes. The fur is short and thick. Their skull has a length of 22 cm and the dental formula is: i 4/3, c 1/1, pm 3/3, m 4/4. Tasmanian tiger's long canines, shearing premolars, and grinding molars, all of which are quite similar to those of dogs. The feet are padded and leave a five-toed print. The females pouch is located by her tail and has a fold of skin covering the four mammae. The Tasmanian tiger was a nocturnal species, but was often observed basking in the sun. It hunted alone or in small groups. There is a controversy over the Tasmanian tiger's hunting technique. Some think that the Tasmanian tiger was an ambush hunter that relied on stealth while others think the Tasmanian tiger would tirelessly chase its prey until the target was exhausted, when it would rush in for the kill. The Tasmanian tiger had many different calls, including a rough bark while hunting, deep growl when irritated, and a whine. Traditionally speaking bringing long extinct animals back from the dead has been left to fiction writers, and boy, we sure got some good stories out of that! Science fiction and fantasy writers have been toying with dinosaurs since we first realized they weren't dragons. Maybe this is why we find the idea so fascinating and hard to put out of our minds. I am sure just about every child must have wondered what it was like to have a pet dinosaur and ride it to school. As adults some of us continue to wonder, and a few of those people are getting into brand new fields of biology where the seemingly impossible is starting to become possible. Ethics professors drool at the opportunity to discuss whether or not we should even go in this direction. What is an extinct animal going to do? Live in a zoo as the last of its kind? Surely we can't release a herd of woolly mammoths into our national parks and expect them to thrive. The ice and snow they used to live in has turned mostly to hot deserts. This dilemma will continue but as usual science is a way of expressing an unquenchable curiosity. I believe it's just human nature to keep plowing forward, no matter how many people are shaking their heads. That being said, here's a list of creatures you may be lucky enough to see alive sometime in the near future. In prehistoric times the Tasmanian tiger ranged from Tasmania, mainland Australia to New Guinea. However, in recent times the Tasmanian tiger was restricted to the Australian island of Tasmania. The Tasmanian tiger preferred open forests and open grasslands, but by the end of its existence it was confined to dense rainforests by human pressures Tasmanian tiger lairs were located mainly in hollow logs or rock outcroppings located in hilly areas that were adjacent to open areas, such as grasslands. Tasmanian tigers lived only on the island of Tasmania in recent history, but fossil record shows that it was also found in New Guinea and Australia as recently as 3000 years ago. Competition with dogs brought by aborigines eliminated it in Australia and New Guinea. These dogs ran wild, becoming the dingo, which entirely filled its niche. A large population survived on Tasmania, where there are no dingoes. When the Europeans arrived and settled in Australia and Tasmania the Tasmanian tiger was thought to be a livestock killer, especially when sheep were introduced in 1824. This was never substantiated, but because of this misconception the privet sector and the government hunted the Tasmanian tiger from 1830-1909 for bounty. In 1830, the Van Diemens Land Company, a pastoral company in Northwest Tasmania, introduces the first bounty on the Tasmanian tiger, claiming that the animal attacked sheep. In 1880, the Tasmanian Parliament placed a price of one pound per Tasmanian tiger scalp. In 1909, the government bounty scheme was terminated. Between 1888 and 1909 a total of 2184 bounties were paid. The actual number of killed Tasmanian tigers must have been even higher. Photo: This iconic image of a bagged Tasmanian Tiger or Thylacine (Thylacinus cynocephalus) featuring Mr. Weaver in a studio portrait is repeatedly published yet it is not attributed. It may have been taken by Victor Albert Prout who sojourned briefly in Tasmania in the late 1860s but is known and praised for his excellent panoramas of Sydney Harbour by contemporary photohistorians. This image is of Australian origin and is now in the public domain because its term of copyright has expired. According to the Australian Copyright Council(ACC), ACC Information Sheet G23 (Duration of copyright) (Feb 2008). This applies also to the European Union, the United States, Canada and those countries with a copyright term of life of the author plus 70 years. The animal became very rare, due to hunting, habitat destruction, disease, and competition with domesticated dogs. The last known alive, named Benjamin, was trapped in Florentine Valley in 1933 and sold to the Hobart Zoo, where it died in captivity on the 7th September 1936. The day-shift keeper forgets to lock the Tasmanian tiger up in its hut and it dies of exposure. Tasmanian law did not protect the Tasmanian tiger until 1936, the same year of their extinction. So it was too late! Photo: The last known thylacine photographed at Hobart (formerly Beaumaris) Zoo in 1933. A scrotal sac is not visible in this or any other of the photos or film taken, leading to the supposition that "Benjamin" was a female, but the existence of a scrotal pouch in the thylacine makes it impossible to be certain. This image is of Australian origin and is now in the public domain, because its term of copyright has expired. According to the Australian Copyright Council(ACC), ACC Information Sheet G23 (Duration of copyright) (Feb 2008). Since then there have been many unsuccessful searches of the remaining area where the Tasmanian tiger could have survived undetected by humans. A 647000 ha. Reserve was set up in 1966 in Southwestern Tasmania in the hopes that possible surviving Tasmanian wolves would have adequate habitat. The Tasmanian tiger has never been officially or reliably sighted since the last one died in 1936. The Tasmanian tiger was officially declared extinct by international standards in 1986.